Yes, it’s pink. And yum. 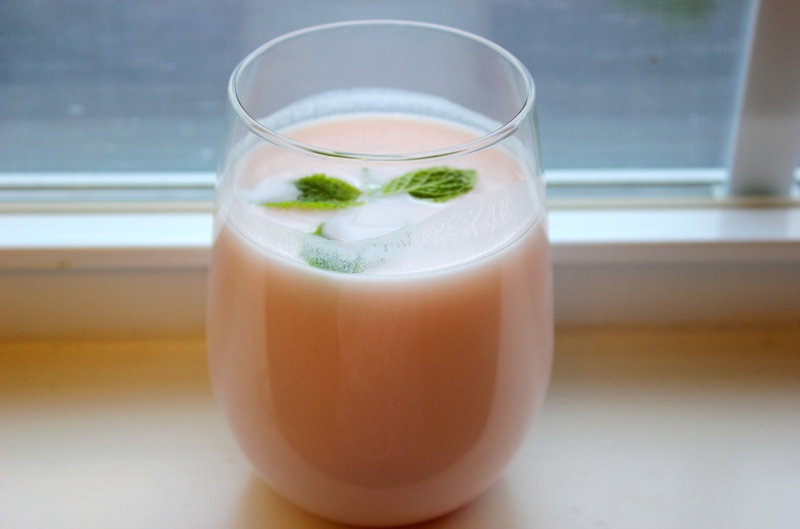 I have always made lassi – both sweet and the salty version. But after seeing this version from one of my favorite chefs on the internet, sweet lassi has never been the same again 🙂 With just a few drops of the famous Indian fruit juice concentrate, Roohafza, the regular sweet lassi gets a super-good flavor and an adorable pink color! Whisk together the yogurt with water and sugar until well blended – adjust the amount of yogurt-to-water as to have the desired consistency. For a nice thick lassi, add 3 cups yogurt with 1 cup water. The amount of sugar needed can be adjusted to desired level of sweetness too, adding a little at a time to the mixture. Add a few drops of the Roohafza or any other fruit syrup and whisk some more to blend well. Pour into serving glasses, top off with some ice and mint for garnishing.